The center aisle of the Cadet Chapel at the United States Air Force Academy. Water damage under a storm window at the chapel. The chapel during early construction. An aerial view of the chapel during construction. The tetrahedron truss that makes up the cadet chapel. 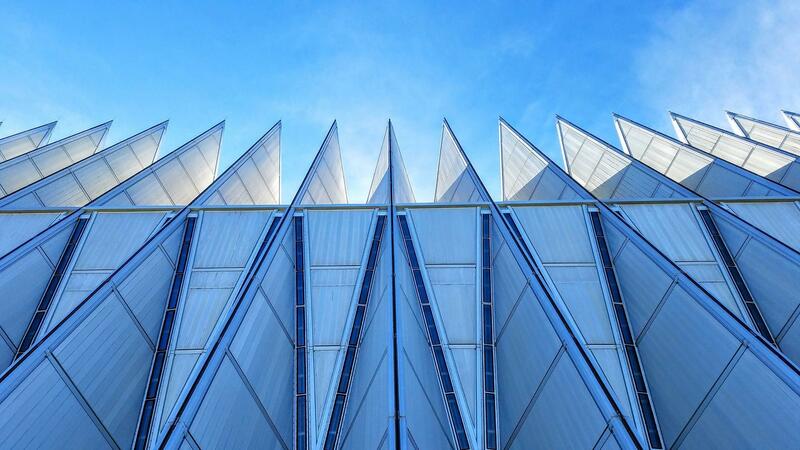 The spires of the Air Force Academy Cadet Chapel. The chapel is in desperate need of renovation, though. Work was supposed to start this summer to restore the decades-old structure. The project was cancelled after $68 million in funds were diverted to projects at Tyndall Air Force Base in Florida, which was heavily damaged by Hurricane Michael in October of last year. Year after year, excessive amounts of caulking have been applied to the many joints on the chapel to prevent water from leaking inside. The caulking has damaged the aluminum exterior. Walking down the center aisle of the chapel, Academy Architect Duane Boyle points out damage. He says the building has endured band-aid fixes from the very beginning. “So, as you walk along here you can see some staining in the acoustic plaster. When it rains here and starts leaking we have to use buckets to collect the water. It leaks that bad,” he says. Many of the issues aren’t obvious at first glance. But in a building of this notoriety and importance, Boyle’s disappointment at the damage is unmistakable. “It's meant to be the centerpiece of the Academy and was always intended to be that way,” he says. The chronic leaking is a huge problem. Boyle says it happens because of a cost-saving change in the initial design because the project was over budget. Duane Boyle is Deputy Director of Facility Management and Campus Architect for the Air Force Academy. To prevent that, the original design included something called internal flashing—basically large sheets of aluminum that would function like a rain gutter. 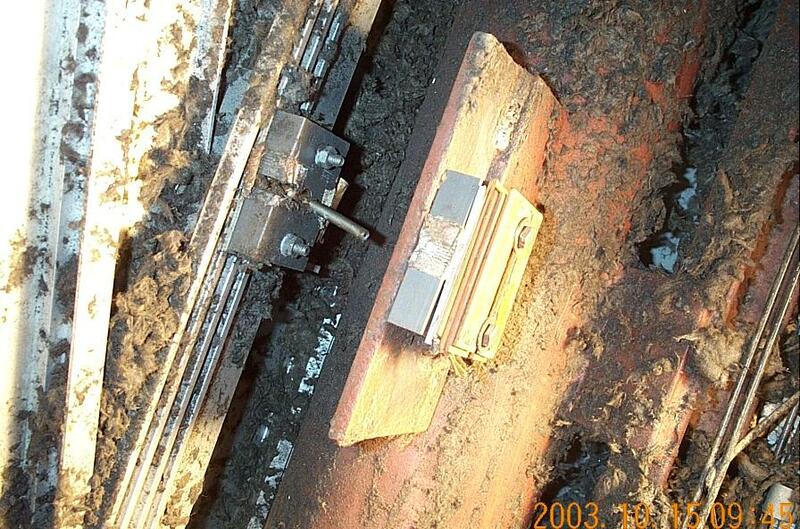 “They were supposed to intercept any of the water that got through the joints and carry that out. And so, all of that was value-engineered out in favor doing the sealants and the sealants have never really worked very well for us,” he says. 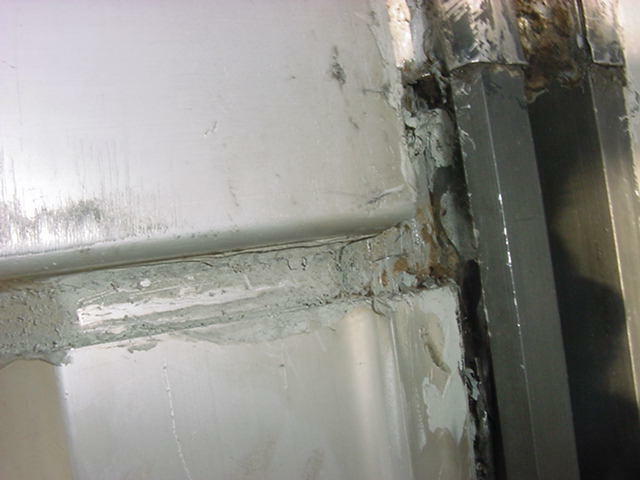 Those 32 miles of joints Boyle mentioned have been repeatedly covered with caulking, damaging the aluminum exterior and still allowing water in. But that’s not the only problem. During the more than a dozen years spent evaluating the building for renovation, Boyle says they noticed how the structure tends to move due to different environmental factors. Water damage to a panel inside a portion the chapel's iconic tetrahedron truss. “The building moves much differently at the south end [and] the north end than it does in the middle. It moves differently from the floor level to the top,” he says. That was also set to be remedied in the renovation process. Boyle says damage at the chapel will only get worse if the repairs are not made. 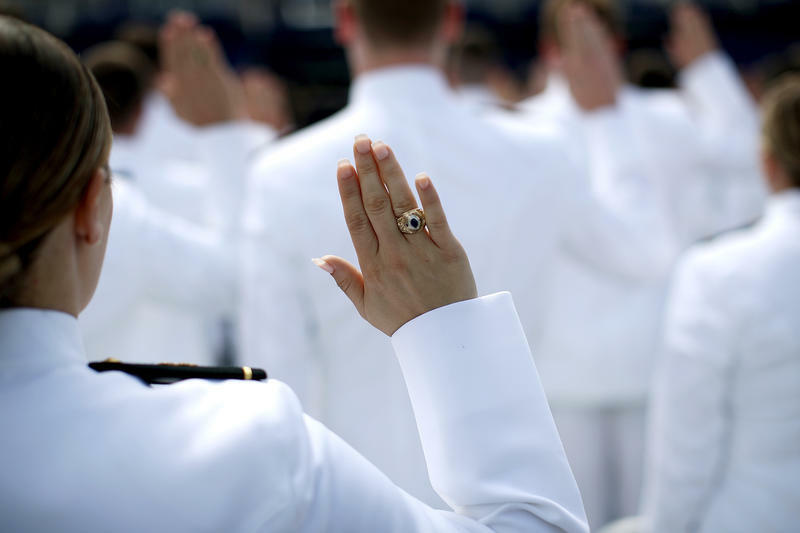 The cadet area was named a National Historic Landmark in 2004. That makes finding someone to do the repairs complicated on a structure that can only be described as geometrically-complex. “The chapel structure that we have here is pretty interesting. It's basically a series of tetrahedrons which is a three-dimensional truss,” Boyle explains. The building is made up of 100 of those identical tetrahedrons or triangular pyramids. Architect Walter Netsch of Skidmore, Owings & Merrill in Chicago is credited with the design of the Academy campus. 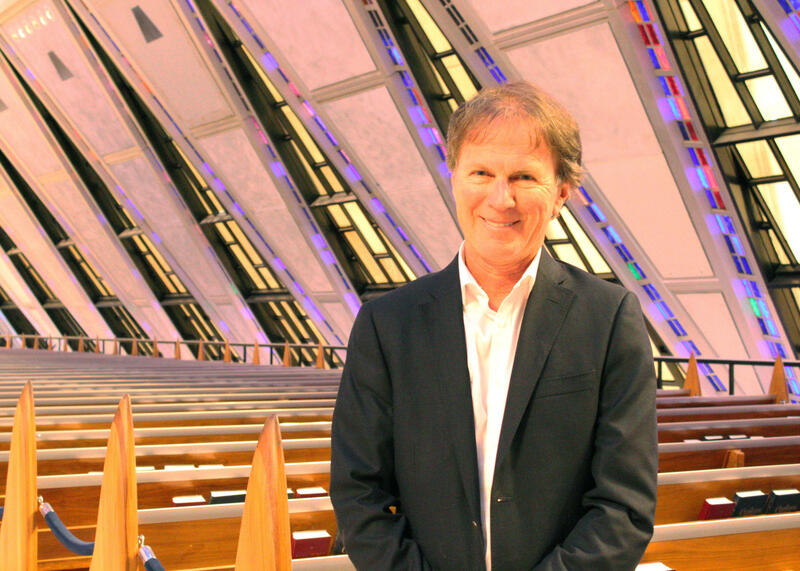 Netsch planned the chapel with his signature aesthetic— field theory, which uses rotated shapes to create patterns based on mathematical equations. If you Google it, you’ll find lots of kaleidoscope-esque sketches. The truss of the cadet chapel, visible during initial construction of the building. “So, each spire is four tetrahedrons on each side- one tetrahedron stacked up on top of another and then two on the other side. And the space in between the spires is basically that same tetrahedron turned 180 degrees and put in place,” he says. 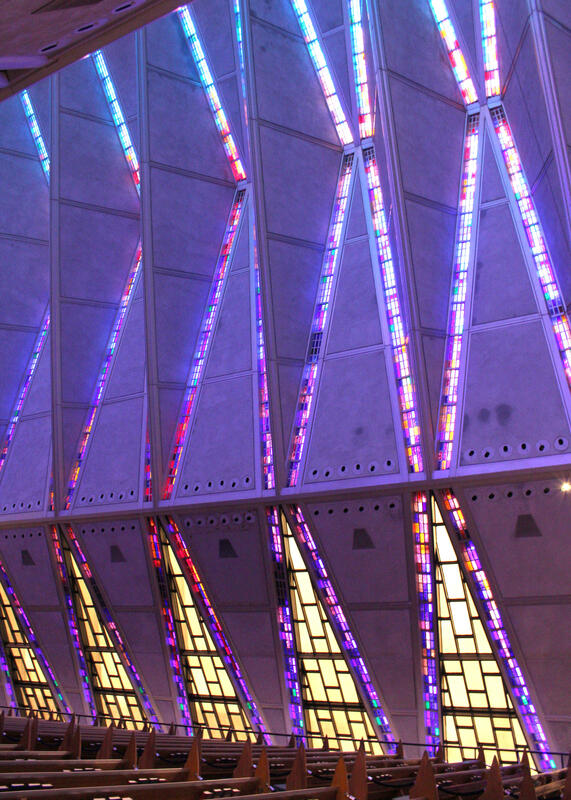 The Cadet Chapel at the United States Air Force Academy is made up of 100 identical tetrahedrons with mosaic ribbon glass in between, pictured here. The chapel is one of the best examples of modern architecture in the world, according to Boyle. Boyle says four religious structures provided inspiration for the building, including Notre Dame. “Notre Dame is 150 feet tall. And that's where the height of this building comes from is Notre Dame,” he says. The other three were Chartres Cathedral, which inspired the chapel’s flying buttresses; Sainte-Chapelle, which aided Netsch in the idea for light coming into the building. “[The last was] Assisi, which is the religious structure that convinced Walter you could you could successfully put more than one chapel in a building and have it work,” Boyle says. Many of the cancelled fixes involved instituting the plans architect Walter Netsch had in place to begin with. That would’ve cost anywhere from $25-100 million. 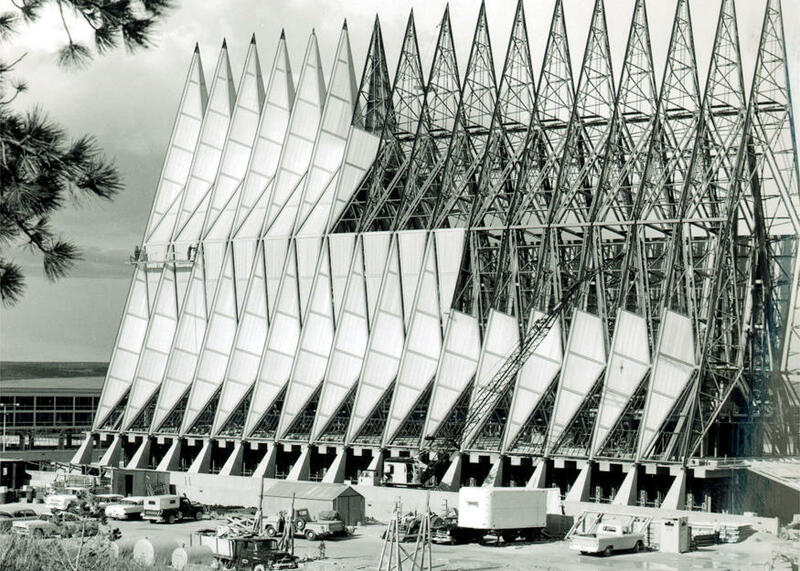 Now that the money has been reallocated though, a spokesman for the Air Force Academy says they don’t know if the renovation will ever resume at all. 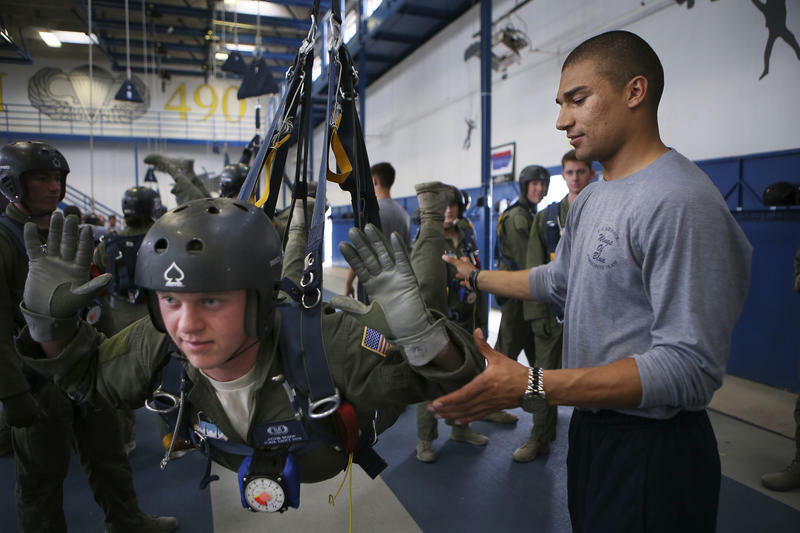 The USAFA Cadet Chapel repair has been deferred as the Air Force looks for ways to secure supplemental funding for budget shortfalls. The Chapel will remain open until a final decision is made. We will provide more information as available. El Paso County Sheriff's Dept. An F-16 with the Air Force Thunderbirds crashed Thursday afternoon after the group's demonstration at the Air Force Academy commencement ceremony.